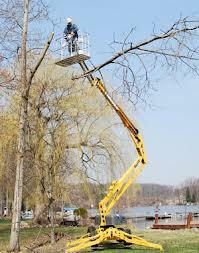 This lift can reach a maximum of 45' platform height. It is 4 wheel drive to maneuver to the work site and uses outriggers to bring the machine to level. It can be put on a heavy duty trailer and towed home. It will require a 3/4 ton pickup or larger to tow. 67'' Outside to Outside of Wheels. 106'' Outside to Outside of Outriggers when they are down. It is 6' 10" in height when in down position. * Please call us for any questions on our lift articulated 45 foot 4 wheel drive rentals in St. Helens OR, Scappoose and the South Columbia County area.